The Siberian Husky, a moderately compact northern dog breed, combines endurance, speed and strength in a way that enables it to carry light loads for long distances at good speed. Siberian Huskies are agile and quick, with an effortless, smooth gait. This dog breed can have varying eye color; brown and blue are predominant, sometimes one of each. Gentle and friendly, highly intelligent but often stubborn, the Siberian Husky makes a great companion for the whole family if properly trained. The Siberian Husky originated in the Siberian region of Russia. Male Siberian-Huskies range from 21 inches to 23.5 inches. Female Siberian-Huskies range from 20 inches to 22 inches. A Siberian Husky male will weigh between 45 and 60 pounds; females between 35 and 50 pounds. Siberian-Huskies can be any color from black to pure white. Symmetrical mask markings on the face are common. Siberian-Huskies have a straight and smooth outer coat and a soft and dense undercoat. Regular brushing is required, particularly during the shedding season. The Siberian Husky is very friendly and gentle. This dog breed is not overly aggressive with other dogs nor suspicious of strangers. 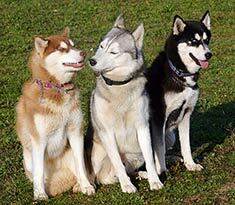 The Siberian Husky is susceptible to epilepsy, hip dysplasia and eye problems. The expected life span of the Siberian Husky is 11-13 years. Siberian-Huskies make good housedogs. A fenced yard and plenty of exercise is crucial for this energetic breed. The Siberian Husky is in the Working group. The Siberian Husky is a beautiful dog descended from the Spitz genetic family. This is the same family that brought us the Alaskan Malamute and the Samoyed. 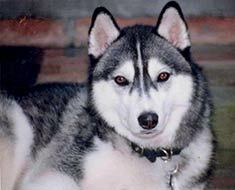 The Husky originated in Eastern Siberia, migrating to Alaska during the Nome Gold Rush. Used originally as a sled dog by the Inuit, the Husky is now often a family pet or a show dog. Pulling sleds is a tough job, requiring lots and lots of energy. If you are planning on buying a Husky, you must be prepared to provide an outlet for his energy needs. The most distinctive feature of many Huskies is their eyes. When they have the gene that gives them at least one blue eye, they have beautiful bright blue, almost aqua, eyes, unlike any other dog. Depending on the genetic inheritance each Husky receives, he may have two brown eyes, two blue eyes, or one of each. Sometimes, they even have eyes that are each half brown and half blue. They're amazing! The body of the Husky resembles that of a wolf, although he is very distinctively marked. The paws and legs are usually white, as is the tip of the tail. The remainder of the body varies from black to grey, to copper-red. Some are pure white, and others may be piebald spotted. There are a wide variety of facial markings, with the most common being "spectacles" and masks. The thick double coat of the Siberian Husky shows its origins in the cold, cold climate of the north. The dense undercoat is covered by the short, straight guard hairs of the topcoat. The coat holds heat against the dog during Arctic winters, when temperatures may fall to 76 degrees below zero! However, the coat's structure also reflects heat in the summer, making this dog flexible enough to live anywhere. The Husky requires very little grooming. They are fastidious and will clean themselves adequately most of the time, although they may need a bit of help if they have been playing in the mud. No clipping is required, but the coat should be brushed, especially when the undercoat blows in the spring and fall. Nose color in the breed is variable, depending on coat color. In black or grey dogs, the nose is black. In copper-colored dogs, it is liver-colored, and in white dogs, it is flesh-colored. Hypopigmentation of the nose tissue can cause "snow nose" or "winter nose", where the color of the nose fades to brown in the winter and returns to its regular color in the summer. As the dog ages, the fading may become permanent. The ears are triangular and carried erect. In many breeds of dogs, erect ears are seen as a fault in the show ring, but in Spitz descendants, it is de rigueur. The tail shape also results from the dog's Spitz heritage. The tail makes a sickle curve over the back, but should not touch the back in the Husky, as it does in other Spitz breeds. The adult female stands about 20 - 22 inches tall at the withers, while males are about one to one-and-a-half inches tall. Females will weigh 35 - 50 pounds, with males about 10 pounds heavier. The Husky carries many behavioral components of the wolf. Rather than barking, he is known to howl, sing, and "talk". (If you've never heard a dog talk, it's absolutely hysterical.) They love to dig holes, and can make a mess of your yard in a hurry. They can be hyperactive, especially if not given adequate exercise. Dogs who are kept for racing are often kenneled until time for the race. When they are released their hunting drive kicks into high gear. From this, you can infer that if you have a Husky as a family pet, you will not want to kennel him for extended periods of time if you are not going to use him for hunting purposes. The dog will chase any small animals that move. Squirrels, rabbits, birds, guinea pigs, hamsters, and cats are all fair game, as far as the Husky is concerned. This is not a dog you will be able to walk off-leash. His high prey drive, coupled with his love of running, makes him a prime target for passing cars. These dogs are extremely intelligent, but are also very stubborn and dominant. Obedience training is required and must continue throughout the dog's life. They do well with positive training methods. You should reinforce training every day by making the dog "perform" his skills before he gets anything that he wants. If you have ever seen an untrained or poorly trained Husky, you will understand why this is important. This is the breed of dog that actually walks his master, rather than the other way around. Sometimes, the person is even airborne! It is only by consistent, fair, positive training that you will get your Husky to obey your every command, which is of course important to his safety. Once you have him trained, you will find that your Husky is affectionate, gentle, and friendly. The Chukchi people of northern Asia bred these dogs in their early history, and held them in great esteem. The breed has such a history of helping humans to survive on the frozen tundra, that people have always treated them well. And, since there aren't a lot of playgrounds on top of the ice, people often encouraged their children to play with the dog instead. Through selective breeding, the Husky has been developed to be gentle to all, and wonderful with children. This does not necessarily speak well to the Husky's abilities as a watch dog. They are not fearful or suspicious of strangers and generally greet guests as a friend, until shown otherwise. The Husky will live about 12 - 15 years on average, but does have a few genetic diseases which primarily affect those beautiful eyes. Juvenile cataracts, corneal dystrophy, and progressive retinal atrophy are all a risk for this type of dog. Juvenile cataracts produce reduction in visual capabilities due to a cloudy lens in the eye, as early as 3 months of age. Corneal dystrophy causes lipids to build up in the outer transparent surface of the eye known as the cornea. This does not affect vision, and is more common in females than in males. Progressive retinal atrophy destroys the rods and cones (vision-sensing cells) of the retina, causing first a deterioration of night vision, then day vision, and culminating in total blindness. About 8% of Huskies can be expected to develop juvenile cataracts, while 3% will experience corneal dystrophy. Only 1% are afflicted with progressive retinal atrophy. Surprisingly for his size, the Siberian Husky does not often become lame due to hip dysplasia. The Orthopedic Foundation for Animals ranks the Husky as 143rd out of 150 dogs as to risk for hip dysplasia. Only about 2% of Huskies will develop this crippling disease. If you are looking for an intelligent, healthy, lovable dog, the Siberian Husky may be the dog for you. However, you need to be aware of his high energy level and love of running. Make sure you have the room and energy required to provide him with the proper exercise and mental stimulation, as well as the patience to deal with copious shedding when his coat blows seasonally. Find Siberian Husky Puppies with our Free Breeder search!